Sometimes, I draw paper dolls and I have wonderful detailed ideas of what I want to say about them. 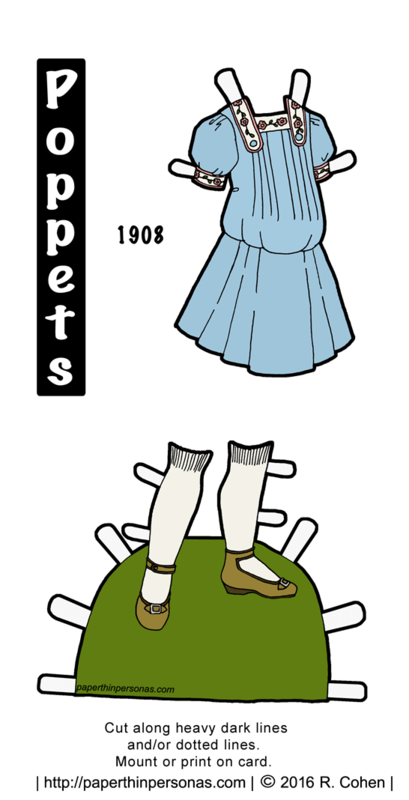 Sometimes, I draw paper dolls and I have really nothing to say about them. 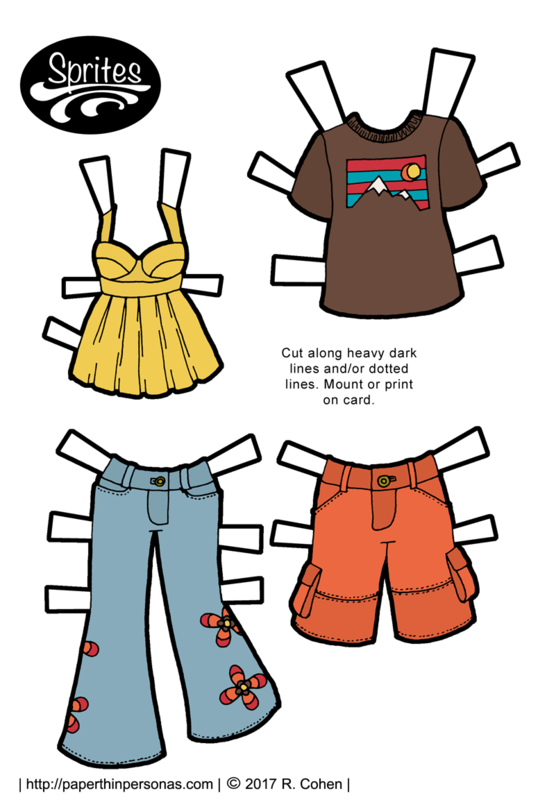 Today’s paper doll falls into the later category. I just don’t really have much meaningful to say about her. I like her, don’t get me wrong, but she’s not as full of complex inspiration as some of my other work. She was a case of drawing the dress and then drawing a doll to go with the dress. I wanted to draw a short chambray dress. One of the big trends this summer is chambray dresses. I mostly use chambray for sewing doll jeans. It’s super useful for that, but it also works really well as a sundress material. My plan was to make two sundresses and use them as a clothing post. I hated the other sundress so much that I scribbled it out of my sketchbook, so that didn’t work out. To salvage the dress that I had, I decided to draw a doll do go with it. Drawing her hair gave me a chance to practice short hair. I need to practice short hair more. Also, I am sort of in love with her eyebrows and I can’t explain why. I designed her shoes to be basics. I wanted them to go with pretty much anything else she might decide to wear. So, what do you think? Cute? Looking slightly pissed off? Let me know in a comment. I always love to hear from you all. One of the classic problems I face is that I tend to draw and then ink and then scan and then post. Sometimes, this means I am posting weeks or months after I drew the paper doll content. While I actually like this schedule, because it keeps me from going nuts, there is a downside. 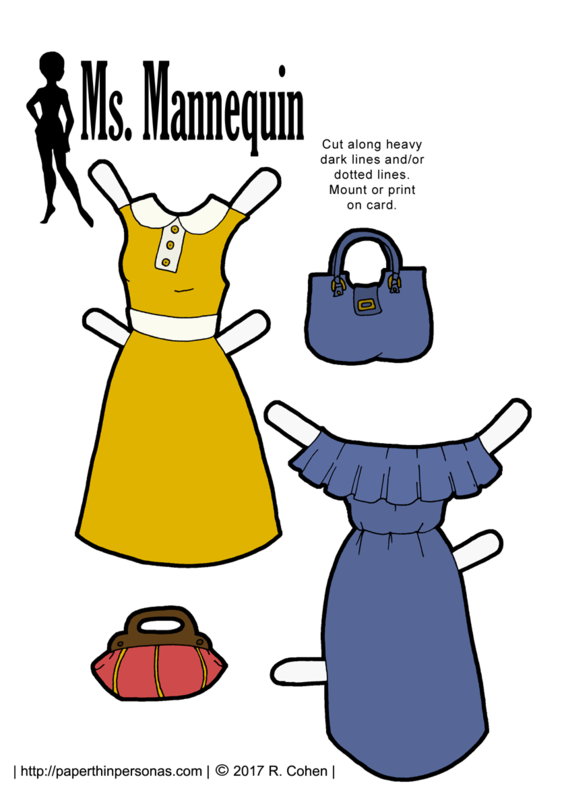 The downside is that sometimes I really don’t remember why I drew a set of paper doll clothing or what inspired me. Take today’s summery Sprite clothing, for example. I have no idea why I drew these. I have the vague recollection that I felt like the Sprites had gotten so much fantasy stuff, that I should create something that was not fantasy. “Something not fantasy” is not the most revolutionary reason to create a paper doll set, but that doesn’t make it less true. I do remember in the coloring process that I struggled to find a color scheme that could be both masculine and feminine. It is no doubt a sign that I have stereotypical views of color, but I struggle with putting male paper dolls in pink. 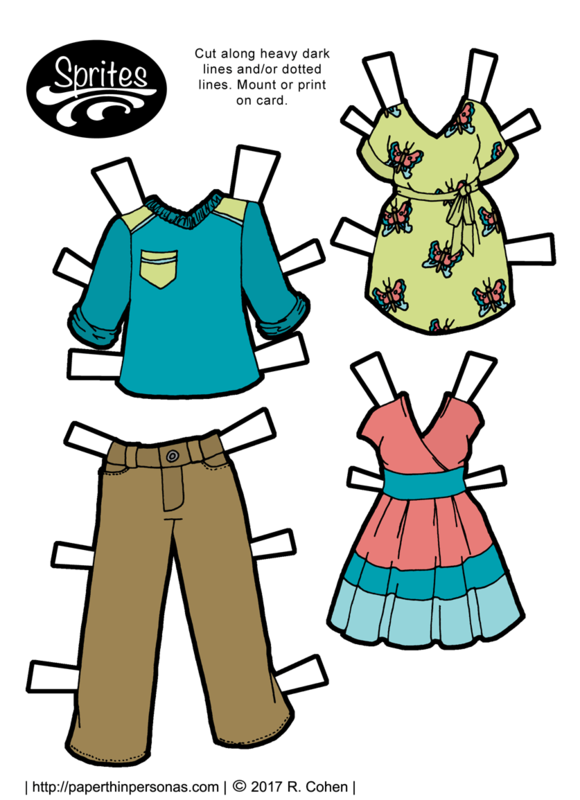 If you do feel comfortable putting male paper dolls in pink, there is always the black and white version of today’s paper doll clothing. In a side note, I really like the butterflies on the green dress and am super proud at how they turned out. Drawing tiny butterflies is hard and I am pleased with those. A few other bookkeeping sorts of thing, I am starting a graduate program in the Fall. I don’t know how it will impact the blog, yet. I hope to continue posting regularly and with a minimum of disruption. However, I can not confidently promise that will be the case. So, I am just trying to let people know ahead of time. Meanwhile, if you want to support the blogs continued “life on the web” than consider becoming a patron and making a small monthly (or one time) donation.